A few weeks ago I travelled to the Reifel Bird Sanctuary in Delta, B.C., hoping to see the flock of sandhill cranes. I was overjoyed to hear that a baby had been born just two days before. The trail where the cranes were located had been blocked off to keep us over-enthusiastic birders out of the area. I came upon a couple of photographers standing on park benches, "craning" their necks to get a look at the little ball of orange fluff. I quickly joined them. Wow, the little one was about the cutest thing I've ever seen! 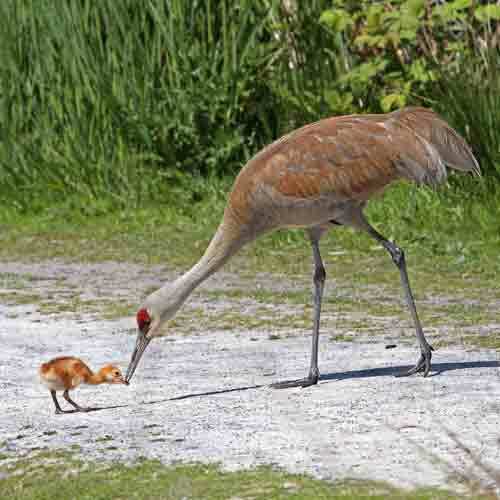 The crane parents and baby were fairly close and didn't seem at all concerned with the goings-on of us mere humans. The baby would sit for awhile then get up and either toddle over to a nearby parent or sometimes he'd run quickly, his unformed wings held out to the side. All to the tune of our shutters clicking madly away. What fun! I managed to capture the shot above of a parent crane feeding the baby some little tidbit...it looks like an insect to me. I noticed the baby was also fed bits of grass. I'm tempted to hop on the ferry again and travel the few hours it would take to get back over to the sanctuary to see how the baby crane is coming along. I shot a short video of the little one too...you can see it, along with other videos of birds, on my website.